Hormones have a massive impact on a woman's body and daily life. As a result, low hormone levels experienced during major life changes, such as menopause and puberty, can unleash a host of unwanted symptoms. This is why it is essential that women are informed of the different hormones circulating around their bodies and the effects that a change in hormone levels can have. Continue reading to discover more about the different types of natural hormones and the symptoms of low hormone levels on the female body. There are three core female hormones - estrogen, progesterone, and androgen. Each has their own specific set of symptoms that occur when women experience low hormone levels. Read the following for a list of the different symptoms of low hormone levels. While low estrogen levels are most commonly present during menopause, women can experience similar symptoms if they undergo a hysterectomy, have chemotherapy or radiation therapy, or have an autoimmune disease. 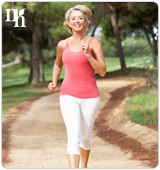 Women with very low body fat, often due to excessive exercise, may also experience low estrogen levels. Panic attacks are symptoms of low estrogen. If women find themselves suffering from the symptoms mentioned above they should visit a medical practitioner. The signs and symptoms of low hormone levels can also be indicative of other diseases and illnesses. Fortunately, there are a variety of different treatment options for women who suffer from the symptoms of low hormone levels. Read the following link to discover more about treating low hormone levels. Having understood the different symptoms of low hormone levels, click on this link to read about normal hormone levels.